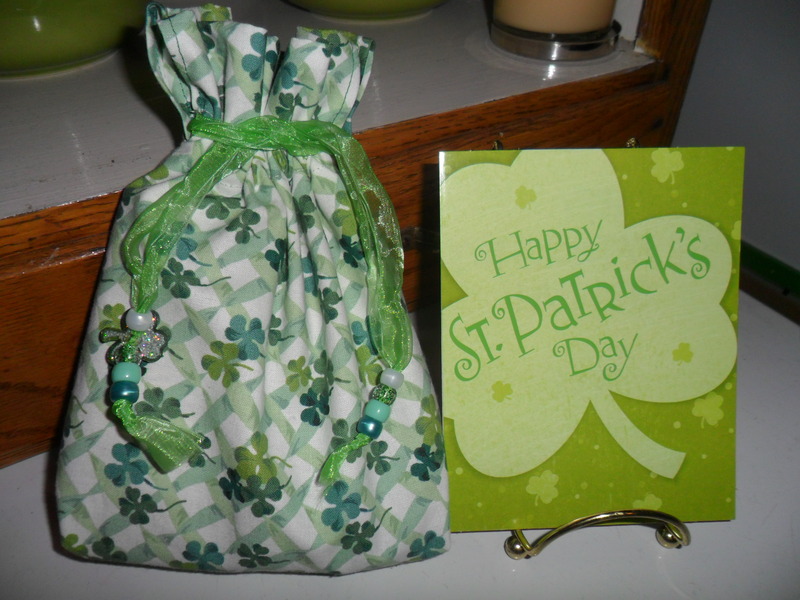 This morning Olivia woke up and came out to the living room to find a treasure left for her by the leprechauns! 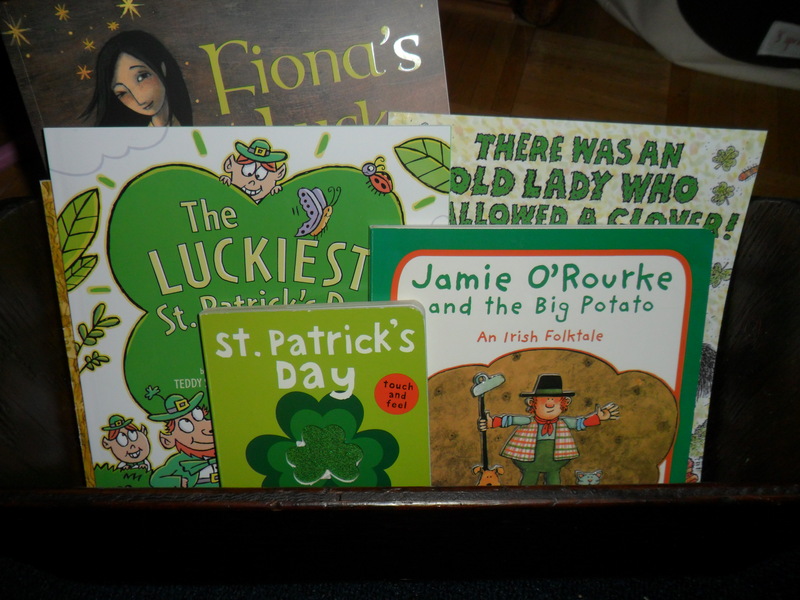 Many, many thanks to my favorite Irish person – my childhood friend Nina – who introduced me to this tradition. When I grow up I want to be a mom just like Nina! Check out all her fabulousness at les petits presents. Olivia’s a lucky girl! 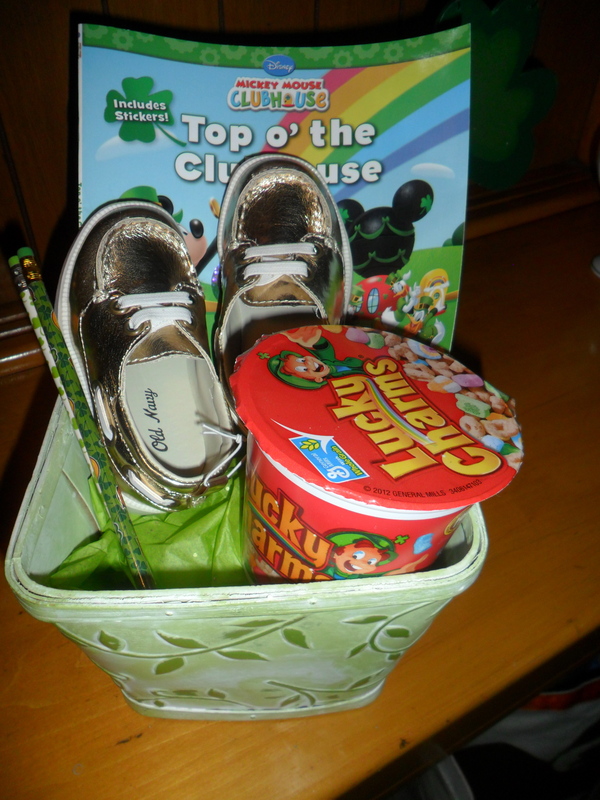 The leprechauns left her a Mickey Mouse book, St. Patty’s Day pencils, gold shoes and some Lucky Charms! If you are a faithful reader of My Color-Coded Life – you know about my holiday cabinet. 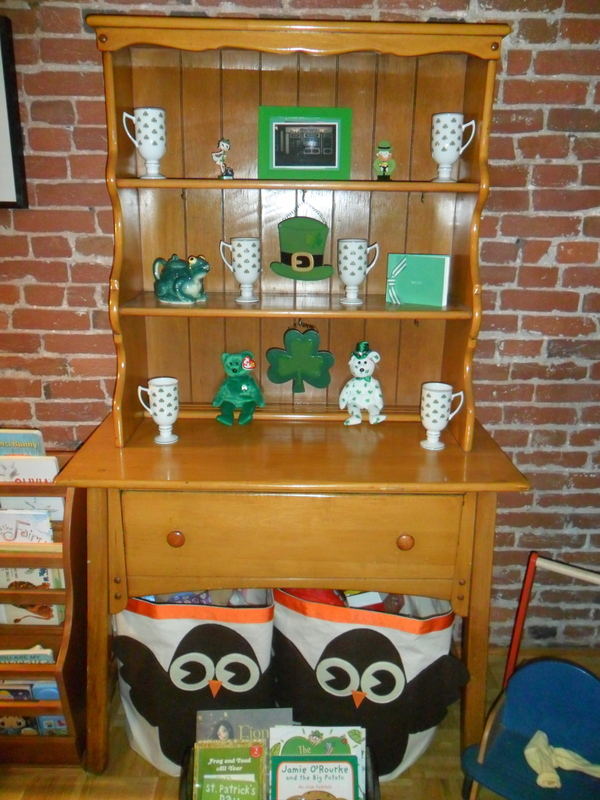 Right after Valentine’s Day – the hearts went away and the shamrocks came out! The coffee mugs are my Mom’s – she used them every St. Patty’s Day. The picture of the top shelf is of my sister in Ireland in front of a pub called Maureen’s Pub. 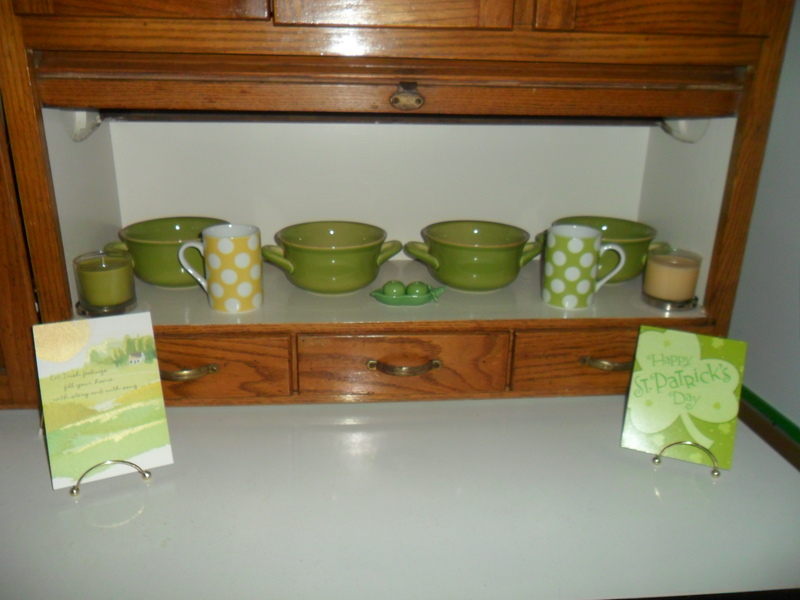 I also return all my green dishes to the kitchen hoosier cabinet in March. Here is one of my sister’s handmade holiday bags. 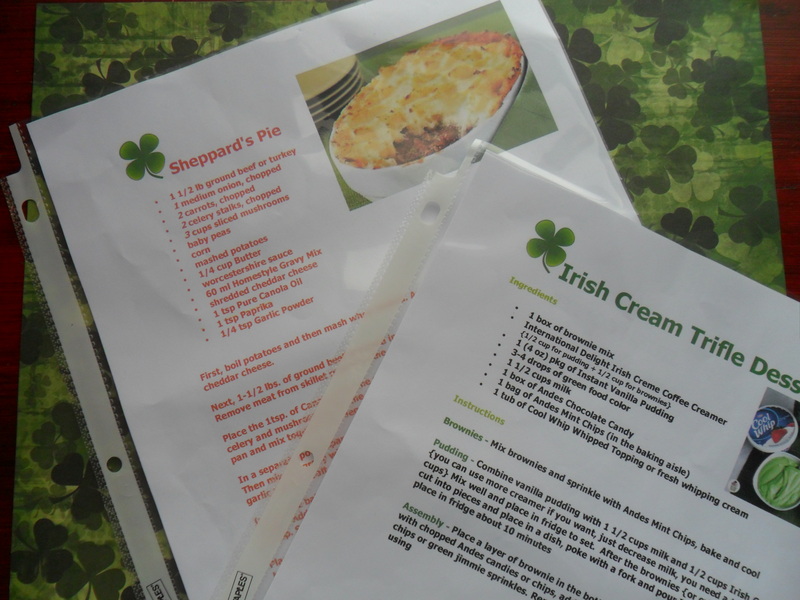 I use these St. Patrick Day ones to give the gift of Irish Coffee! A small bag of coffee – which I get at at gourmet coffee store right near where I work. They package their coffee in gold and green – perfect, right? 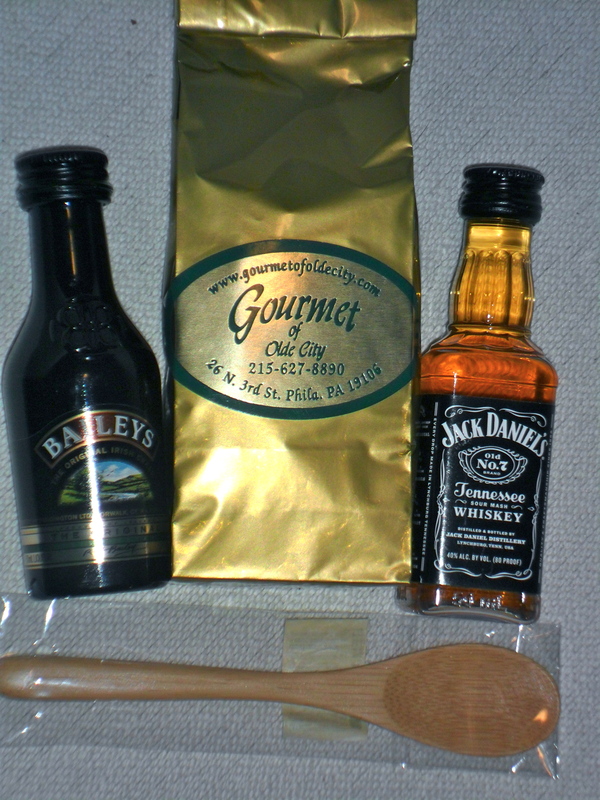 A nip of Bailey’s Irish Cream, a nip of whiskey, and a small wooden spoon. I am baking brownies and about to start the gravy for Sheppard’s Pie. 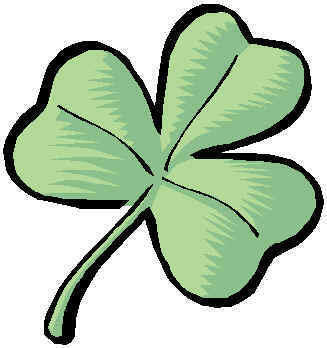 I’ll post picks of our Irish menu and Olivia’s St. Patrick’s Day outfit this week. Happy St. Patrick’s Day from our family to yours! First of all, thank you!!! That is one of the nicest things anyone’s ever said to me! What a compliment. And second of all you already are a mom just like me! Olivia’s so lucky to have you. So glad you had a fun day. Love all the details. Hi Maureen! It’s Anna Maria! Wow! You’ve been busy! A new daughter and a blog called My Color Coded Life! You are way too organized, girl, but everything you do is just so cute and creative. Miss hearing the pitter=patter of Curtain Creations, but since you left, we have had dance studios up there successfully. The current tenant of the past two years is Chantel Price Dance Studios. She is doing great. I think the last time we saw you and Larry was when we bumped into you back during the holidays on the escalator at Borders in Center City. That was way before the crash of 2009, so that was about 2007-2008. I think you left in 2007 or 2008 — can’t remember. It would be nice to stay in touch and catch up on the past five years. Alanna is already 15 and a freshman in high school at Neumann-Goretti. Arianna is 22 and graduated Masterman in June of 2008. She graduated Temple in three years in December of 2011 and started Temple Dental School in August 2012. She’s nearly through her first year. She bought a property with her boyfriend, who is in his last year at Temple Law School. Carmen and I are getting old and fat and way too stressed out with this horrible recession. It’s been a tough five years. Leave me your cell phone number so we can re-connect! I enjoy reading your Color Corded Life blog, but only when I get automatic emails from LinkedIn. I’m much too busy to explore the site on my own — I only go on when it comes to me passively! Hi Anna Maria – thanks for reading – great to hear what the girls are up to! Hope everyone is your family is well!